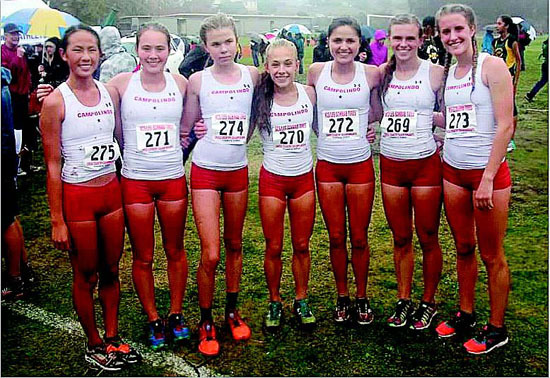 After a strong season, the Campolindo girls' cross-country team finished in second place at the Division III CIF State Championships on Nov. 29 at Woodward Park in Fresno. The Cougars placed two runners in the Top 11-senior Toni Finnane claimed second place and Mary Orders finished in 11th. Ranked No. 1 entering the race, the squad actually had even bigger plans for the day. "Although we were very pleased to be on the podium, I think it was kind of a letdown, as the girls had some pretty high expectations," said head coach Chuck Woolridge. Senior Parker Lothamer set the pace for the Campolindo's boys' team, finishing in 16:07. The boys placed ninth overall. "To be a Top 10 State meet finisher is always pretty significant," said Woolridge. "It's the 11th year in a row that we've done that. The boys can walk away feeling proud of continuing our streak." The Miramonte boys' team also took part in the State meet, claiming 18th place in the Division III race. Senior Sid Bagga, who ended up in 85th place, led the way for the Mats. The Acalanes boys' team ended up placing 23rd out of 23 teams, but co-head coach Nate Beach believes there are positives to take away. "It was good for them to get the experience and I think that it's going to help them build toward next year." On Saturday, Nov. 22, Campolindo took first place in both races at the NCS Championships at Hayward High School. On a rainy and windy day, the girls' team had five runners in the Top 10. Woolridge called it the "best performance" of the season. "The course was muddy and it was raining during our race, and yet they posted the fourth-fastest team time ever in the history of that course," said Woolridge. Even though nobody finished higher than ninth, the Campolindo boys' squad had five runners in the Top 15. "What I like about our boys' team is that it really isn't a team, it's a pack," said Woolridge. 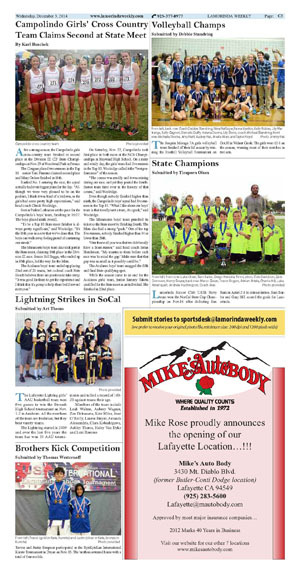 The Miramonte boys' team punched its ticket to the State meet by finishing fourth. The Mats also had a strong "pack." Out of the top five runners, nobody finished higher than 14 or lower than 28th. "Our theme all year was that we didn't really have a front runner," said head coach Brian Henderson. "My mantra to them before each race was 'to mind the gap.' Make sure that that gap was as small as it possibly could be." The Acalanes boys' team snagged the fifth and final State qualifying spot. While the season came to an end for the Acalanes girls' team, junior Sammy Taketa qualified for the State meet as an individual. She finished in 22nd place.